How Tough Outside Sports in the Heat Really Are! As school starts high school sports begin to start which includes football. This last month temperatures have risen a lot from 90 to 100 or hotter. 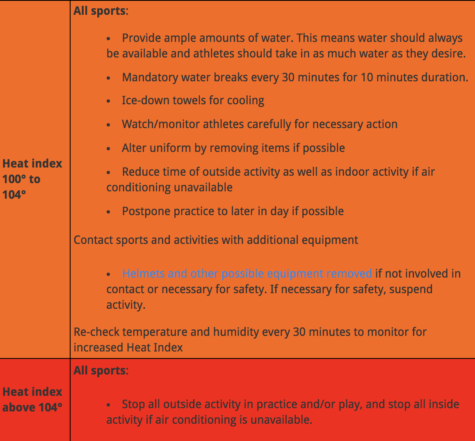 As these continues to happen the question is it too hot to play sports is asked. The football team practices about four days a week for about two and a half hours a day. I spoke to Junior, Cameron Bailes and he said, “Having to practice in the 110 degree weather has started to put a toll on me because of how much energy it took out of me.” Not only are these football players out in the heats putting work in. Sometimes it is even more tiring and hot to have to wear all the gear they are required to wear. As I began to do my research I found from Forbes, “According to the National Center for Catastrophic Sports Injury Research, 52 football players died over the period 1995 to 2012 from exertional heat stroke (EHS).” This information doesn’t even count the deaths from 2013 to now. Although you may not die right away heat is a silent killer. In conclusion, I have gathered although many people don’t talk about it heat can be deadly. As the summer comes to an end and it becomes less hot athletes still need to remember to stay hydrated. Don’t forget if it gets to hot and you don’t feel well make sure to tell someone!